Thirteen days in a row with highs in the 70s F (21-26 C) (but not hotter) in southeast Alaska is quite notable. This is what just ended in Haines, and close to it in Petersburg and Wrangell. This graph shows the nice consistent dirunal (day-night) pattern of clear weather at Haines. (The data is from the airport, where on the 20th it did not quite make it to 70, but it did at the slightly warmer climate station, so that’s where the 13 days is). I’ve blogged before of how the surface pressure pattern determines whether the airflow in Southeast Alaska is onshore or offshore and what a dramatic effect that simple “on” or “off” switch has on our weather. I’ve also mentioned in passing about the “balanced” situation where neither onshore or offshore flow is strong enough to hijack the weather. In this case we have in-between weather, “Goldilocks weather,” and how nice it is…and how rare it is to have it for more than a few days at a time. This just right weather is even harder to come by in winter and perhaps more coveted then. I’ve blog about these winter extremes here and here. What you can see in the wind barbs in the graph is a slight offshore (NE) flow at night, then an onshore sea breeze (SW) coming up in the afternoon, dying off in the evening with a repeat almost every night-day during the period. 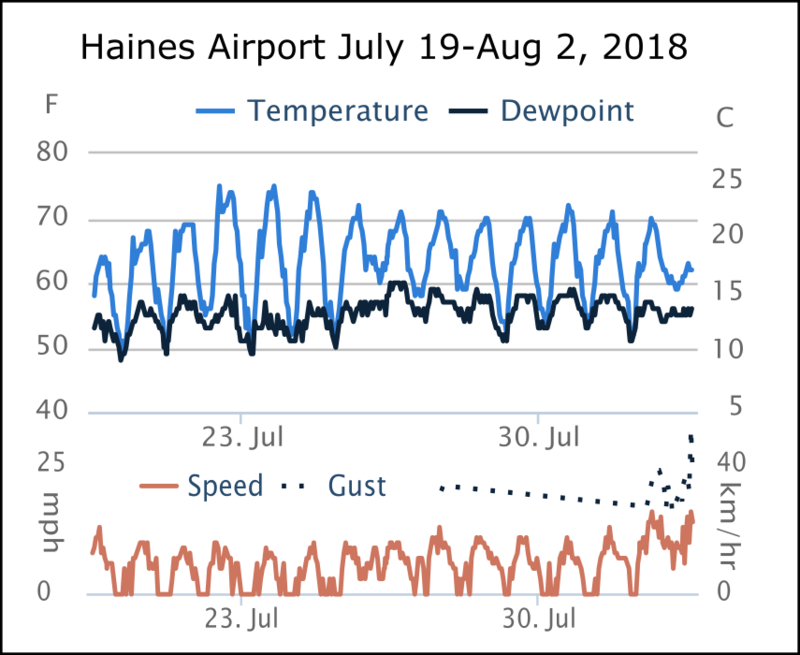 The wind speed trace in the first graph shows a similar pattern in Haines… wind speed rising with the temperature quite regularly each day and in this case going calm during the night. The direction had a similar pattern to Skagway also, light offshore early morning, with the sea breeze starting up in the late morning. 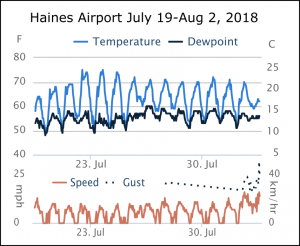 For the Haines airport the offshore wind is northwest and the sea breeze southeast due to the orientation of the valley. More on channeling in this article. Back to the ridges… although they have a general clearing effect they also tend to create low clouds and fog over the ocean and push them onshore. That was seen along the more exposed coastal sites as detailed below, but as usual this marine layer was blocked by terrain and did not make it to Haines or Skagway, nor in any meaningful amount to Wrangell or Petersburg. I should note that although I’m focusing on the last 2 weeks, it’s been quite dry since early June around SE AK with several warm spells thrown in before this one, notably the very warm 4th of July weekend. Juneau had their warmest July on record. Now I’m usually pretty careful not to spout hard, fast good-bad descriptors on the weather, so I realize I’m in danger of going astray with this piece. What qualifies as good or bad weather is rather personal, based on what one is used to, and what kind of activities one has on their agenda. For instance if I need to do physical work outside I’d prefer cloudy weather, some wind to keep the bugs away, and temperatures not above the low 60s F (16-18 C). But aside from the work angle I don’t think I’m going too far out on a limb to say that most people would think that the past 2 weeks in Haines has been hard to complain about. Yes there is some dust near unpaved roads, and increased fire danger, etc, but in this case the lack of any temperatures over 80 F (27 C) or any strong winds tempered these concerns. If you are just wanting to go to the state fair or take a walk on the beach I’d call it near perfect. And we’ve had just enough high or mid clouds from time to time to get some nice sunsets. What about other SE towns during this period? Skagway… winds most days built to 15 to 20 mph (24-32 km/hr) and some days gusted over 30 (48 km/hr). Yakutat… much cooler with some rain during the period. Juneau… several days over 80 F (27 C), too warm for most Alaskans. Gustavus… a little cooler but still nice temperatures, but a fair amount of low clouds and fog. Hoonah… most days in the 70s and close to 80, but also the marine stratus like Gustavus. Sitka, Craig, Klawock… more like Gustavus, but even more low clouds and fog in the mornings sometimes hanging in through the day. Wrangell, Petersburg… very close to the Haines experience. Perhaps the winds were a little too light at both to provide sensitive Alaskans with just a little cooling? Nevertheless l include these two on the podium for this run of “just right” weather. What do you think? Please use the comments link for any feedback, questions etc.